A number of Texas day care centers are in rough shape after Hurricane Harvey, adding one more challenge for parents trying to get back home and find work — they’re unable to find a safe place to leave their children. Jacqueline James looks over at infants playing in the only building in her child care center that did not suffer severe damage from Hurricane Harvey. With her husband incarcerated on a murder charge, Jacquene Fontenot single-handedly wakes and dresses five kids under the age of 5 every morning, drops them off at a local child care center and drives two hours to her job as a custodian in central Louisiana. Fontenot, who lost her furniture when her apartment in Orange flooded during August’s hurricane, could not imagine what she would do if she lost her child care. “I really don’t have a second option,” she said. 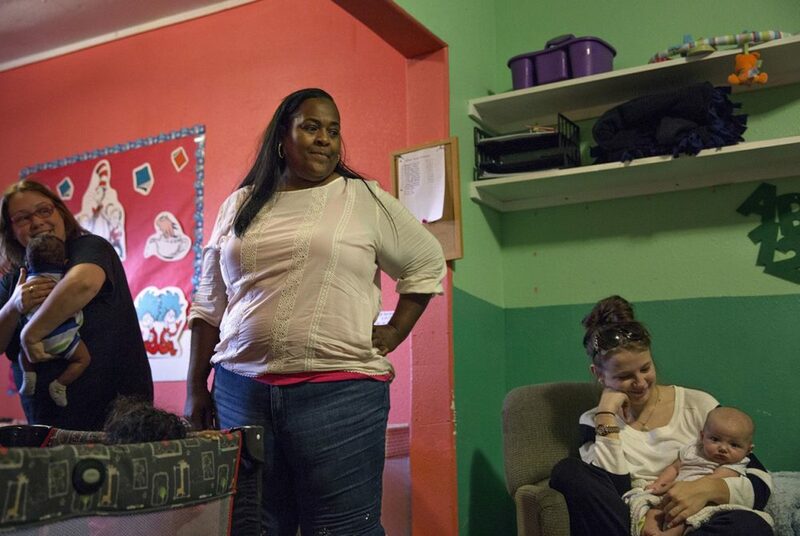 During Hurricane Harvey, the James Hope Center, her children’s for-profit day care, took on water and a layer of mold began carpeting its walls, leaving owner Jacqueline James floundering for a solution that wouldn’t leave more than 100 families, many of them low-income, stranded. With so many day cares closed and more in danger of closing, parents face difficulty moving back to their homes and getting back to normal, with no one to take care of their kids when they’re at work. Private child care centers, often run by individuals, churches or nonprofits, are struggling to recover from the hurricane’s destruction, especially in rural communities where they are among few options. Many child care centers are small, for-profit businesses that don’t qualify for federal disaster funding despite the crucial services they provide to families, De Marrais said. 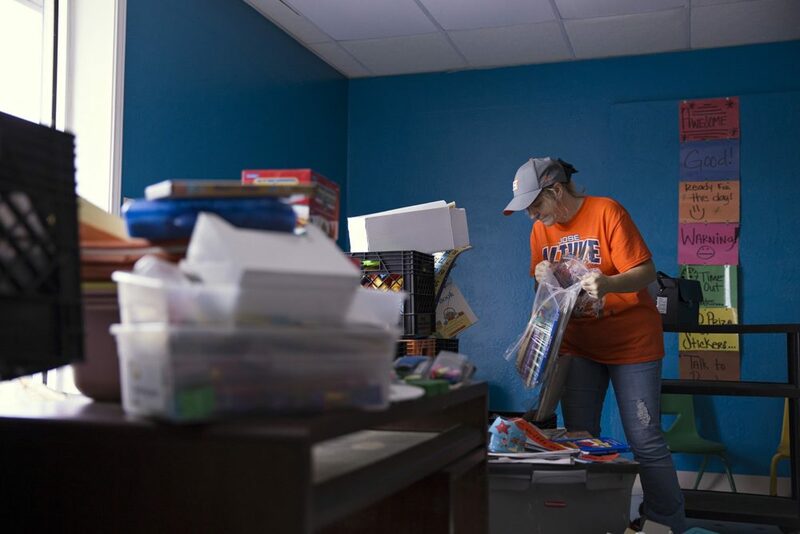 Anna Lingo sorts through salvaged items from the James Hope Center after the Orange facility was flooded during Hurricane Harvey. In Orange, James plowed forward with the resources she had. She got the state to let her shut down her family’s restaurant and use the open eating space as a temporary center for about 60 older children. She and her husband own an additional building already in use to care for about 25 infants. And she found a former bakery up for lease in West Orange and put her family members to work replacing ceiling tiles and ripping out walls to create a permanent center. 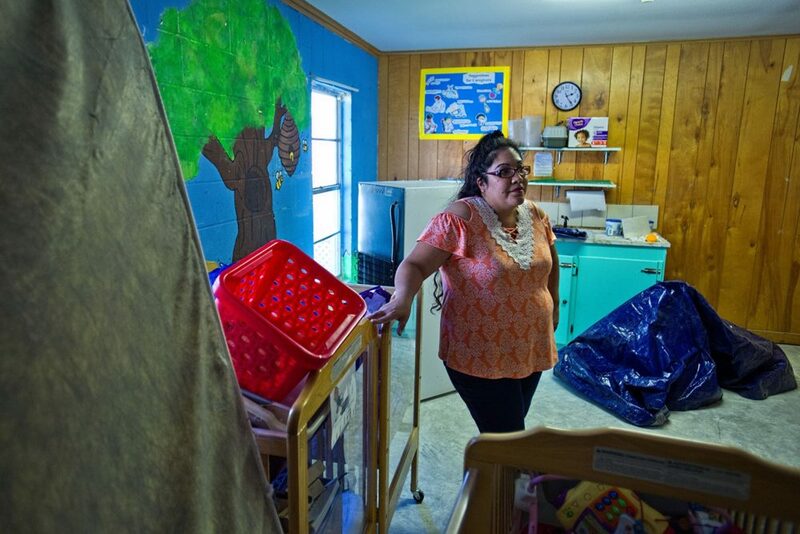 Farther south along the coast, LaVeta Rodriguez, director of Little Lights Learning Center in Rockport, drained the day care’s savings — more than $10,000 — for renovations after major water damage in the roof and ceiling. Most of the community around the day care has not yet returned. Dependent on the tourism industry, many Rockport residents can’t count on employment now that restaurants and hotels are out of service, said Timothy Baylor, the day care’s founder and pastor of New Beginnings Ministries, which houses Little Lights. The day care lost eight of 10 staff members and a larger percentage of its students. With not enough staff or students to operate, Rodriguez and Baylor surrendered Little Lights’ child care license, hoping to reapply and reopen once Rockport is rebuilt. They are using money they’ve raised to host a full-day program of activities and meals twice a week, taking children off their parents’ hands while they look for work. “In the relief tent, they’re asking, ‘When are you going to open? I can’t work because there’s no child care,'” said Jose Alvarado, a volunteer for the church and a parent at the daycare. He’s the founder of a small local business repairing and detailing yachts. Few in Rockport are thinking about their yachts, with walls of debris turning rural roads into labyrinths and homes stripped down to skeletons in battered lots. Even if Alvarado wanted to work full-time, he’d have a hard time. He and his wife, who works full-time at a medical office, are fostering an 11-year-old girl who had attended an after-school program at Little Lights Learning Center. Now, Alvarado picks her up from school every afternoon. There aren’t many other day care choices in the area. State records show just four other licensed child care centers in Aransas County, including one that is temporarily closed. LaVeta Rodriguez, director of the Little Lights Learning Center, stands among the unused cribs, toys and equipment in the baby room at the Rockport center. 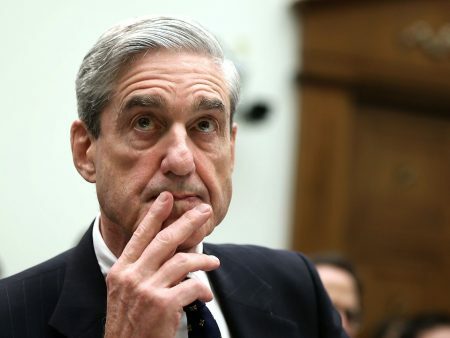 In rural areas, “there might not be another child care center within 20 or 30 miles of them,” said Anna Hardway, director of programs for Save the Children. 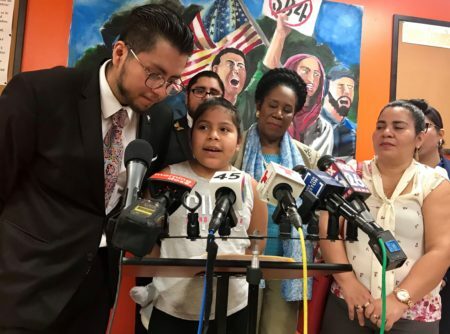 She recalled speaking to a school principal who begged her to help get the local child care center up and running so teachers and parents could get back to work. 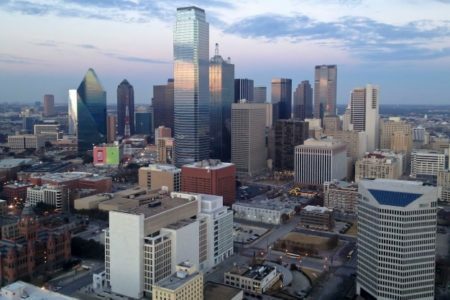 Children at least 3 years old who meet the federal definition of homelessness, which includes many of those displaced by the hurricane, are eligible for free public pre-K in local school districts, according to the Texas Education Agency. But parents, educators and experts interviewed by The Texas Tribune said they didn’t know that option was available. When Harvey swept through the coastal town of Portland, Methodist Day School’s flat roof turned into a “swimming pool,” and water leaked into the building, said the day care’s director, Jamie Hartley. “Our building isn’t really old and it’s in good condition, so we weren’t expecting for the building to be damaged at all,” she said. As they wait for their roof to be rebuilt, the day care’s directors are indefinitely leasing space from the Gregory-Portland school district for $3,259 per month.